Atlantic Monthly Press, 9780802120304, 245pp. James Howard Kunstler's critically acclaimed and best-selling The Long Emergency, originally published in 2005, quickly became a grassroots hit, going into nine printings in hardcover. Kunstler's shocking vision of our post-oil future caught the attention of environmentalists and business leaders alike, and stimulated widespread discussion about our dependence on fossil fuels and our dysfunctional financial and government institutions. Kunstler has since been profiled in The New Yorker and invited to speak at TED. In Too Much Magic, Kunstler evaluates what has changed in the last seven years and shows us that, in a post-financial-crisis world, his ideas are more relevant than ever. 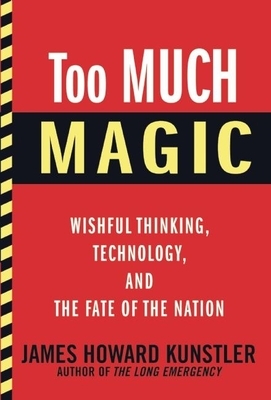 "Too Much Magic" is what Kunstler sees in the bright visions of a future world dreamed up by optimistic souls who believe technology will solve all our problems. Their visions remind him of the flying cars and robot maids that were the dominant images of the future in the 1950s. Kunstler's image of the future is much more sober. With vision, clarity of thought, and a pragmatic worldview, Kunstler argues that the time for magical thinking and hoping for miracles is over, and the time to begin preparing for the long emergency has begun.